The Freakshow RDA from Wotofo is anything but ordinary! 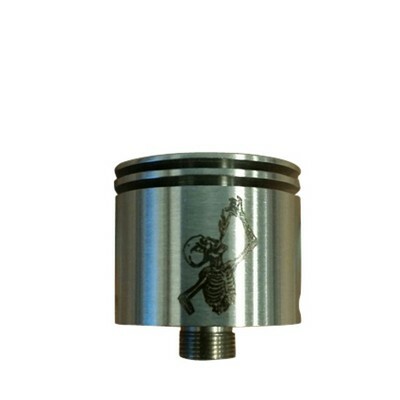 This 100% authentic rebuildable drip atomizer was designed to stand out from the crowd. First and foremost, the 8mm adjustable airflow system is postioned at the base of the atomizer to maximize airflow over your coils, and is configurable for both single and dual coil builds. A silver plated positive contact keeps voltage drop to an absolute minimum, while five strategically placed Delrin o-rings (as well as a Delrin insulated drip tip sleeve) keep heat in its place. The Freakshow is a 22mm diameter RDA; which makes it fit comfortably on a variety of mods, as well as being compatible with both the included heat-dissipating finned top cap as well as drip tops. Designed and Manufactued by Wotofo. Bottom Airflow Control System with 8mm wide vents. Silver Plated Positive Contact pin. 5 Delrin o-rings prevent unwanted heat build up.